He married Ellen Tvede. He was survived by his second wife Duscha. 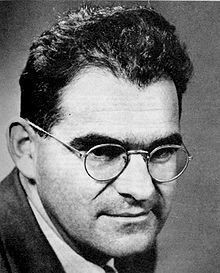 ^ "Weisskopf dies at 93; was protégée of physicist Niels Bohr". MIT News. 24 April 2002. Retrieved 20 February 2015. ^ "Victor Weisskopf, Group Leader - Los Alamos Theoretical Division". The Manhattan Project Heritage Preservation Association, Inc. 2005. Retrieved 20 February 2015. ^ "War and Peace in the Nuclear Age; Weapon of Choice, The; Interview with Victor Weisskopf, 1986". openvault.wgbh.org. Retrieved 2017-06-05. ^ Office of the Home Secretary; National Academy of Sciences (1 January 2004). Biographical Memoirs. Vol. 84. National Academies Press. p. 375. ISBN 978-0-309-08957-9. ^ Gottfried, Kurt; Jackson, J. David (February 2003). "Mozart and Quantum Mechanics: An Appreciation of Victor Weisskopf" (PDF). Physics Today. 56 (2): 43–47. Bibcode:2003PhT....56b..43G. doi:10.1063/1.1564348. ^ Hine, Mervyn (January 2003). "Working with Viki at CERN". CERN Courier. ^ Kummer, Wolfgang (June 2002). "Victor Weisskopf: looking back on a distinguished career". CERN Courier. 42 (5): 28–32. ^ "Public Welfare Medal Recipients". National Academy of Sciences. 2015. Archived from the original on 9 August 2013. Retrieved 20 February 2015. ^ "Past and Present Presidents". American Physical Society. 2015. Retrieved 20 February 2015. ^ "Academy Presidents". American Academy of Arts & Sciences. 2015. Retrieved 20 February 2015. ^ Chang, Kenneth (2002-04-25). "Victor Weisskopf, a Manhattan Project Physicist, Dies at 93". New York Times. Retrieved 2017-06-06. ^ "Weisskopf wins Oppenheimer Prize". Physics Today. 36 (7): 77. July 1983. doi:10.1063/1.2915767. ^ "Reply to a parliamentary question" (PDF). Österreichisches Parlament (in German). Wien. 23 April 2012. p. 1372. Retrieved 5 January 2013. Wikimedia Commons has media related to Victor Weisskopf. Chang, Kenneth (April 25, 2002). "Victor Weisskopf, a Manhattan Project Physicist, Dies at 93". The New York Times. Retrieved December 11, 2018. This page was last edited on 28 January 2019, at 19:12 (UTC).